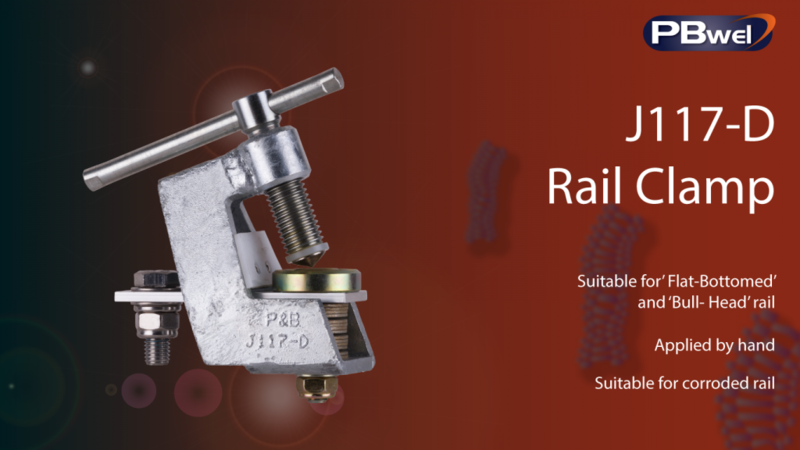 The J117 rail clamp, or G Clamp is designed for fitting to all types of rail in common use throughout the UK. The clamp is ruggedly constructed from steel which is zinc galvanised to provide protection from site atmospheres. As well being used on Long Blue Earths, the J117 clamp is also fitted to the Short Circuiting Strap. The J117 rail clamp contact arrangement allows for the use upon both ‘Flat-Bottomed’ and ‘Bull-Head’ rail types. The body has an insulating shield fitted to prevent welding to the rail, should the clamp be subjected to a fault current. Secure location upon the foot of both ‘flat-bottomed’ and ‘bull-head’ rail types is provided by a hardened tip above the rail and a grooved block beneath the rail. The hardened tip fits into the operating screw with an insulating bush to ensure that the correct contact path is made. The grooved block fits directly on top of the copper busbar, ensuring a very low contact resistance path. The busbar sits upon a stack of disc spring washers, which should be fully compressed when the clamp is applied. These washers apply a pre-loaded pressure upon the rail in order to maintain firm contact through changing weather climates, whilst maintaining contact pressure should the clamp be subjected to fault current. The operating screw is rotated by a ‘tommy bar’ which is free to slide within the hole in the head of the operating screw. The tommy bar is retained at each end to prevent removal. The clamp is suitable for fitting via either 12mm or1/2″fasteners in the busbar.